I've mentioned before on this blog that I don't do much cooking here. We eat lunch at school during the week, and it is a fairly large meal most days. In the evenings I generally make up some packet soup and we have grilled cheese or egg salad sandwiches with it. I have been getting cooking apples recently and cooking them up so we have some fruit cooked for dessert. Today in the bazaar we picked up a few groceries. Dan often goes in during the week but on our way home from having poori bhaji we usually get a few things. This time we stopped at Ram Chander, where we got some butter, brown bread, tea bags and salt. I also stopped at the chemist (pharmacist) to get a couple of things. I thought I'd again try the "Nervup" vitamins that the orthopedic doctor recommended last spring. Dan stopped at the dairy to pick up our weekly supply of dahi (yogurt). We buy a kilo at a time and they package it in a plastic bag with a rubber band around the opening. 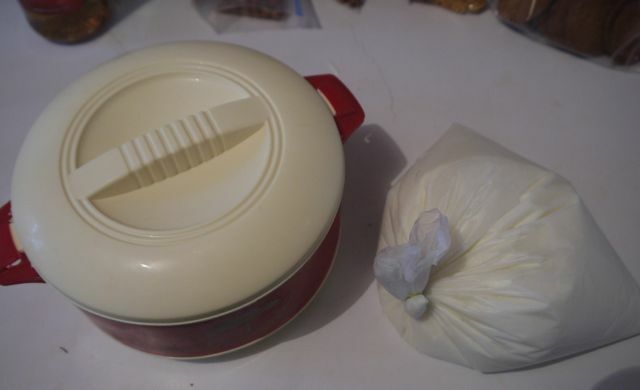 We have this insulated container that holds exactly one kilo. We keep it in the refrigerator. We use the dahi on muesli at breakfast and ladle it into most flavors of soup. I decided to go all out today and get some vegetables for a change. (I always have onions, which I sauté and add to most of our soups.) Here they are on our marble counter top in the kitchen. 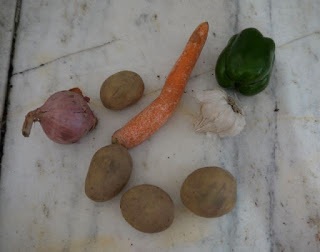 The potatoes are very small; the green pepper is about half the size of most US ones. I chopped up the potatoes and carrot and boiled them until they were tender. 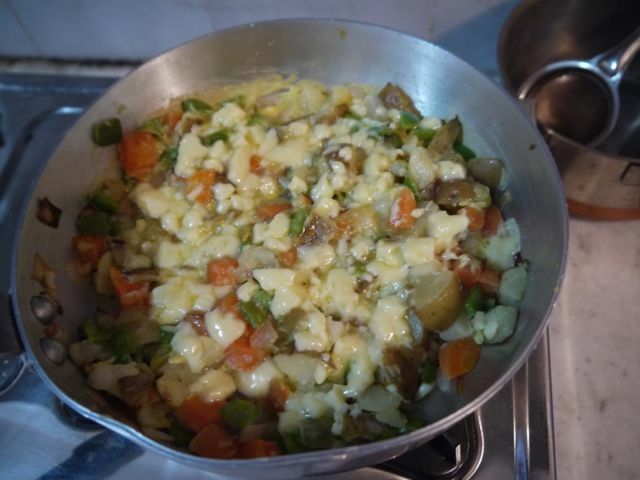 Then I sautéed the chopped onion in butter, added the chopped green pepper (called capsicum here) and some garlic. After that was well-done, I added the cooked potato and carrot. After they were all well heated and smelling good, I added two beaten eggs and some crumbled cheese on top. Here it is just before serving. Our skillet is about 8-9 inches, so it was just the right amount for two for supper! Very satisfying and I got to do a little cooking.